Every year we visit the Pumpkin Patch and this year was no exception. Before we visit the children explore and learn about pumpkins and Fall, through crafts. Hands on fun are a must. Good books too!! It was very chilly visiting the Pumpkin Patch. The weather didn't stop them from enjoying a good old fashion hayride and picking a pumpkin of their own. then you must join them!! Maddux everyday wants to hang up his coat, because he loves order. He sees all of the other coats neatly hung, and he wants to follow along. Maddux is now successful with this task after being shown how. Boy,did he practice!! There are hooks lower, but Maddux is challenging himself with this work now. He has turned the Firefighter jacket into a dressing frame. Mastering those clasp!! I am not endorsing dress up in a Montessori setting, I am just sharing what has worked for Maddux. As soon as another child put the scissor work back on the shelf. Avi made a mad dash to retrieve it. She really wasn't paying attention to my presentation, just determined to get those scissors in her hand!! I asked an older child to sit with her and cut alongside her. Avi liked this idea and had fun getting to know another friend that she wouldn't let out of her sight for the rest of the day. Avi is two years old. Today was her first day and she fit right in. Looking forward to getting to know you Avi. Mia(4) started working with the Mental Insets some time ago. Today she decided to add another element to it. She asked me if I would write the name of the shape for her on the paper next to her drawing. The next thing she did was start writing! Mia spelled out the word Mom and then wrote her dad's name. Just another reason why I love the Metal Insets. One things for sure young children thrive off of routines and repetition. This expectation that they have for me makes my job a little easier. When it came time to add in some new seasonal works I decided to first put out familiar works. The whisking bubbles activity is just as popular as it was last year. It is so much fun!! Have you tried this activity with your children? Thank you to all who entered! I had so much fun reading the comments, and I loved when you shared your favorite post. You can expect to read those type of postings in the near future. You can also see the announcement of the winner on the Giveaway post. Jess you have 24 hours to contact me so I can send the package to you. Our topic for Day 6 is Apples! Mother Goose has included a lot of great activities for this day. The children will be making a Johnny Appleseed Craft. I have placed the stencils on the shelf so they can continue to make one using construction paper, this promotes some creativity and get some fine motor skills in play. I will also be telling the story of Johnny Appleseed through storytelling pieces, and a script that was provided. A file folder game was suggested for this day and also provided that I decided to make it a shelf only activity. I like to keep Circle Time short and sweet. The child sorts the words and pictures according to sound. The letters are "a", "o", and "r". There is a control of error that is built in, the words and pictures are color coded according to the fruit growing on the trees. On the back of the file folder I placed a library pocket to hold the game pieces. The kids here love file folder games so I just put it where we keep the other file folder games. There is a lot more to do on Day 6, like playing the rotten apple game where the game pieces are provided. Also journal writing in their Little Journals. We will do these activities just on a different day. Day 5 Topic Discussion was about Leaves. The leaf topic poster is pictured above. I make copy of the posters for the children to color whenever they desire to. Often when they are coloring the poster they begin to wonder, and ask specific questions about what is on the poster. We briefly talked about what sound does "a" make . The card materials that you see comes in the Day bag too. They went on a hunt to find puzzle pieces to match the picture. The puzzle comes in the bag, I made a copy for them to match to. Our Circle Time activities take anywhere from ten minutes to twenty five minutes. We go over the Days of the Week through music and movement. We do calendar time which includes, counting and pattern recognition. Weather is done by using the picture clues on the board and a child places the circle on the correct picture. Many of the Mother Goose Time activities are for "school" time. I use the activities for Circle Time only. This allows whole group activity time to take place, a child most likely gets to take something home, and most importantly it allows for topic discussion. The topic discussions have been wonderful in developing language skills, as well as get other children who would normally shy away from participating in number activities, or writing. Overall this is a fun way to expose children who are not interested in certain things like letters and numbers to participate. During Circle Time we read the book a Visit to The Apple Orchard . The book is including in the Day 3 bag, but I decided to reread the story again on Day 4. Also one of the monthly letters were introduced, and so was one of the numbers. After reading the story we talked about different types of apples and I presented the Types of Apple cards. They also had a fun time painting and making Apple Headbands( all of the supplies are included in the day bag, except paint and glue). 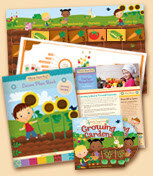 On Day 4 there is also an activity which comes with a recipe card to make Mini Apple Pies. We made the Mini Apple Pies the next day. If I used this curriculum the way that it is intended to be used then their is plenty of time to complete all of the activities on the same day. After we complete our circle time activities we go straight into our Montessori Work Period. I do not present any new work lessons during circle time. I always do this during small group work or individually. I will only present lessons during Circle Time if it has something to do with our Topic discussion of the day. It has been awfully quiet over here! I have come to the conclusion that it must be time for a GIVEAWAY. I ordered our October's supplemental curriculum and by mistake they sent me two boxes. They told me to just keep the extra box, but I don't need two. I thought it was a perfect time to get y'all to make some noise over here!! 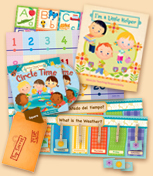 The GIVEAWAY is for one month of Mother Goose Time Curriculum for October for six children. You will receive a package that will contain 20-23 days of learning, everything you need to implement the curriculum except for basic supplies like glue and scissors. If you choose to complete the baking activities you'll need to have those ingredients on hand. It will arrive at your doorstep and you will be ready to do school. Go here to drool over the Teacher Resource bag and the contents. The Day Bags will keep your preschooler busy playing I Spy, singing songs, discovering the mystery shape, and making crafts. I think you are going to love how these bags will have your child begging for circle time. The kids here walk into school asking about if it is time for Circle Time. I'll warn you before you pop over there that you may get distracted, don't forget to enter the Giveaway. October's theme is In the Orchard. Week 4:Comparing skins and shells. There is just so much to list so please click here for more detailed information about the theme. You will see the shape of the month, letters of the month, numbers of the month, colors of the month and the genre of music for the month. Yes you will receive two Cd's in your box, and a Free Book. If you are following along on this blog you will get a chance to see some of the learning activities you will receive as the WINNER of the GIVEAWAY. I will post our Day bag activities starting Monday, October 8,2012 and end on Friday, October 12 ,2012. This should help you decide if you want to enter the Giveaway before it closes on Friday, October 12,2012. 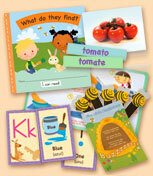 This curriculum is geared toward children ages two and half through five years old. Once you get it in your hands you can tailor it to fit your children's need. Some of the work I put on the shelf for individual choice making, other work we do during Circle Time. I encourage you to visit Mother Goose Time and explore their site. On another note I know this is a package specifically designed for October, but you can definitely use this curriculum well into November. The children here like to repeat activities so if you have just one child and not six, you have enough to continue this theme for as long as you like. Or just do the activities that you know the children will like and save for a later time. This boxed curriculum is a classic I have been using this curriculum on and off since my eleven year old daughter was three. The more entries you make the more noise on this blog, and a greater chance for you to win. The name tags have done wonders for recognizing their name and saving their work space. I thought it would be a good idea to count seeds and reinforce number counting from 1-6, especially since they are eager to count all the seeds inside apples and pumpkins. It is all about Fall in our neck of the woods, which means it times to taste all those delicious apples that have been picked and pumpkins are surely a point of interest for children this time of year.